If you are looking for Phi Phi information then phi-phi.com is your best source of information. The original website has been written by people with an uninterrupted relationship with the island since 1992. This ensures you get the best idea of what is happening real time. The website has info on Phi Phi hotel and resorts, the best places to eat on Phi Phi, places to visit and some tips and tricks to get the most from your Phi Phi holiday. If it is style you want there are articles describing the trendy restaurants of Phi Phi. If it is seafood, there is a good article describing what to look for in fresh seafood. If it is local food you want beware, the Phi Phi curry is hot even by Thai standards. The Phi Phi Island facebook page will give an interesting variety of views from visitors to the islands and the page is moderated by those who have businesses and are working on the islands to give balanced and where needed detailed responses. Work out the places to go and the places to avoid during your Phi Phi holiday. As with any holiday destination there are tips and tricks to make your holiday go better and the Phi Phi resources available on the site help you do just that. Phi Phi Nightlife guide is good but also search through the articles for the best Phi Phi bars and trendiest restaurants as well as where to go for the best diving, swimming, snorkeling, sunbathing and more are at your fingertips. You will enjoy an amazing Phi Phi holiday when you spend some time on the site and learn all about this wonderful island destination. Useful links to help you choose your hotels are by star rating, style of resort and the all important swimming pool.. If you are looking to relax and recharge your batteries you might want to try the hotels at Laem Tong, Loh Bagao or Phak Nam. For something more central with a huge variety of restaurants and bars, try Phi Phi Don Village and for a quieter beach but only 10 minutes by longtail boat to Phi Phi Don village try Long Beach. 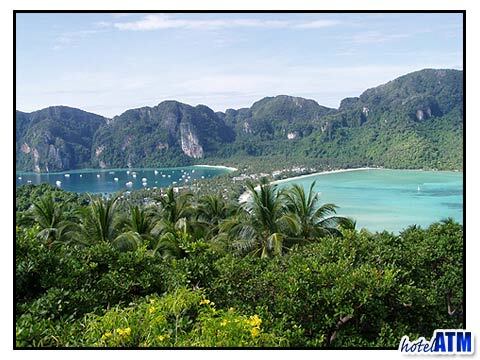 An other best of Phi Phi to consider when you are choosing a hotel is what activity do you want to do while on Phi Phi. If you want to hang out at a quiet resort, the northern resorts are good. For those who want to be on the beach there are many resort that can do that. However if you want to swim or snorkel from the resort beach that is actually a lot more complicated. In Tonsai Bay the Phi Phi Cabana Hotel and Sand sea Resort, Nice Guesthouse and PP Popular are on the swimmable Tonsai Bay, but Arayaburi, Bay View, Andaman Beach resort, Andaman Legacy, Phi Phi Don Resort, Chao Koh Phi Phi Lodge, Phi Phi Banyan, Phi Phi Hotel, are on tidal beaches. Visit phi-phi.com and learn more about this great island destination and plan your perfect holiday on this perfect holiday destination. What can be more wonderful than a holiday on an island paradise? Plan the ultimate Phi Phi holiday on phi-phi.com...!